Chet Lunner addressed an audience at the Winslow Public Library as part of a series sponsored by the Maine Humanities Council. 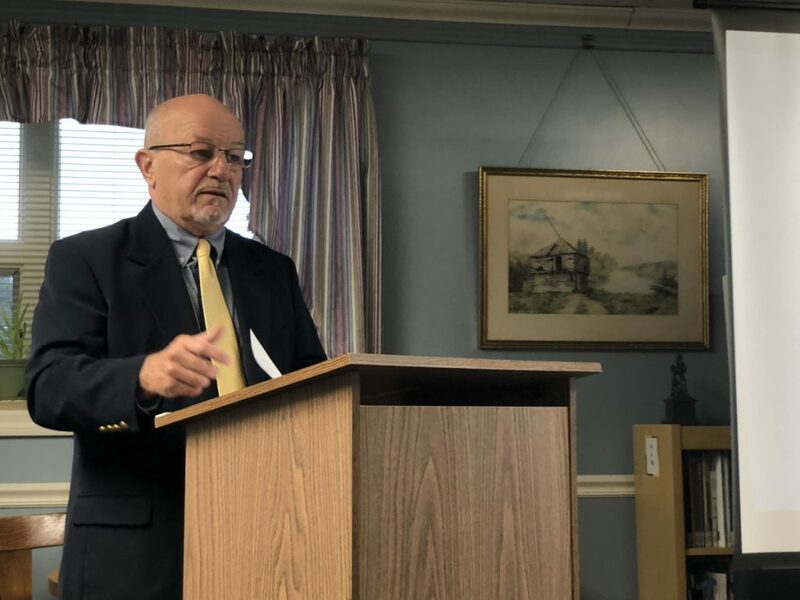 WINSLOW — The credibility of American journalism is suffering amid today’s fake news epidemic, but real reporting isn’t dead — at least according to Chet Lunner, who spoke on the topic Thursday night at Winslow Public Library. The crux of his message was that “the freedom of the press belongs to those who own one,” an idea popularized by New Yorker journalist A.J. Liebling. And now, with the rise of social media platforms such as Facebook and Twitter, nearly anyone in the world can own, effectively, a personal “press.” At the clack of the keys and the click of a button, misinformation can make its way into the world, unvetted. While traditional media outlets follow strict codes of ethics, with editors investigating the legitimacy of information, today’s digital climate often shifts that onus to the public. A Pew study reported that two thirds of Americans get their news from social media — a problematic statistic in a world where, for instance, Russia can target ads and videos that reach 146 million Americans, as they did to sway votes around the 2016 election. Lunner is no stranger to the press, having started his career as a reporter and editor before transitioning to public affairs, which included a stint as chief communications officer at the U.S. Department of Transportation, where he advised on media strategy in the wake of the Sept. 11, 2001, attacks. In Maine, Lunner held editor roles at the Kennebec Journal, the Biddeford-Saco Journal Tribune and the Portland Evening Express and served as the founding president of Maine’s chapter of the Society of Professional Journalists. He was a national correspondent for Gannett News Service and USA Today in Washington, but he has devoted the past 15 years to the Transportation Security Administration, Department of Homeland Security and — even in retirement — a number of national security consulting and education organizations. In his days as a local reporter, Lunner cited the experience of sitting across from a town councilor and a police chief at a coffee shop as something that helped hold him accountable for fair reporting — and which is lost in the digital age. The solution to fake news is contingent on citizens regaining trust in American politics and news media. Lunner cited a Readers’ Digest poll that named Walter Cronkite as the “Most Trusted Man in America” in 1966, compared to 2016’s results, in which no media or political figure placed in the top 10, and Tom Hanks replaced Cronkite at the top slot (notably, before he played Ben Bradlee in 2017’s “The Post”). Lunner urged readers to actively seek news from a range of sources rather than “echo chambers for your own biases.” He also provided several resources that individuals can use to help evaluate sources and sort fact from fiction. Among these are: the News Media Alliance, Newseum Ed, Politifact, factcheck.org and snopes.com. Last evening’s lecture was part of the World in Your Library series, sponsored by the Maine Humanities Council and the Margaret Chase Smith Foundation. This program brings Maine-based experts who can provide deeper context to local and international current events to speak at libraries throughout the state. As of press time, there are no World in Your Library events scheduled at Winslow Public Library for the remainder of the year. A full schedule can be found at mainehumanities.org.